bi-folding doors Our ModLok™ We offer a totally unique option, thanks to the patented exoskeleton design giving them unparalleled strength, security, and durability. No other PVCu bi-folding door has been tested to over 127,000 full opening cycles; and with low U-values, PAS:24 and Secured By Design accreditation, the ModLok™ is in a class of its own. Ideal for large openings, ModLok™ bi-folds enables you to open up an entire wall of your room – creating space and letting fresh air and natural daylight flood into your home. Whether you have a bedroom with Juliette balcony, a kitchen-diner, a conservatory or an orangery, Liniar ModLok™ bi-folding doors can provide a stunning alternative to a patio or French doors. Available in a wide choice of opening configurations and colours, the Liniar ModLok™ bi-fold has ultra-slim sightlines, providing rooms with a clean, modern appearance. Safety features include the innovative low threshold option for family-friendly and wheelchair use. What’s more, Liniar bi-fold doors offer high energy efficiency, combined with the best security features on the market – bringing you a modern space-saving solution for your home that will definitely give it the ‘wow’ factor. Description: Made-to-measure Three panelled bi-fold folding sliding door. This door is two bifold .. 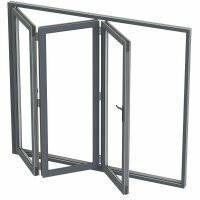 Description: In Stock Two panelled Modlock bi-fold door. Price includes door and glass. Using.. Description: Made-to-measure Two panelled Modlock bi-fold door. Using 70mm sculptured profile inte.. Description: Made-to-measure Three panelled bi-fold door. This door is one folding unit, there is .. Description: Four panelled bi-fold folding sliding door. This door is four bifold panels centre sp.. Description: Made-to-measure Four panelled bi-fold folding sliding door. This door is one folding .. Description: Made-to-measure Four panelled bi-fold folding sliding door. This door is three bifold.. Description: Made-to-measure Five panelled bi-fold folding sliding door. This door is one folding .. Description: Made-to-measure Five panelled bi-fold folding sliding door. This door is four bifold .. Description:Made-to-measure Five panelled bi-fold folding sliding door. This door is a three - two.. Description: Made-to-measure Six panelled bi-fold folding sliding door. This door is one folding u.. Description: Made-to-measure Six panelled bi-fold folding sliding door. This door is six bifold pa.. Description: Made-to-measure Seven panelled bi-fold folding sliding door. This door is one folding.. Description: Made-to measure Seven panelled bi-fold folding sliding door. This door is Six bifold .. Description: Made-to-measure Seven panelled bi-fold folding sliding door. This door is a five - tw..
UPVC Double Glazed Made to measure Bi-fold 7 Pane Folding Door with a 4 - 3 Pane split. Description: Made-to-measure Seven panelled bi-fold folding sliding door. This door is Seven bifol.. Description: Made-to-measure Six panelled bi-fold folding sliding door. This door is five bifold p..